London Gatwick Airport caters for all passengers, including those with reduced mobility and can extend their service to fulfil your requirements. The airport recommends contacting your airline at least 48 hours before you fly to ensure you can book specific mobility services to get you on your flight in time and you may need to inform your airline of any mobility items you will need to take on the flight with you such as wheelchairs or mobility scooters. If you or someone you are travelling with have a hidden disability such as autism, IBD or dementia for example, it can sometimes be a daunting task to navigate through an airport. This is why Gatwick are proud to offer a discreet lanyard that can be worn throughout your time in the terminal. The lanyard will notify staff that you may require a little extra support or time to get through security, but it won’t tell staff or other travellers which disability you have. Special assistance help points for all those with a disability or mobility difficulties are located on both terminal forecourts, short stay car parks, stations, baggage reclaim halls and on some routes within the terminals where there are long walking distances. There are special drop-off points on the forecourts for passengers for Blue Badge holders or passengers who’ve booked assistance at the airport. There are also help points located nearby in case you need extra assistance. Passengers should head to the departure lounge desk after check in and security, where the concierge will check their boarding pass and provide them with a pager to alert them when their flight is due to board. If the passenger cannot manage stairs they will need to inform the concierge who will make arrangements to get the passenger on the plane. You can also use the specific reserved seating in the PRM area of the departure lounge while you await your flight. Gatwick Airport have opened a specialist lounge in the North Terminal, close to the departure lounge, and has been created to give a relaxed and welcoming feeling for passengers who require special assistance. The lounge seats 90 passengers and comes with a host of useful features to help travellers relax before a flight. You can expect; easy access, dedicated reception area with hearing induction loops, water fountain and toilet facilities, as well as numerous charging points for passenger transport vehicles and personal electronic devices. Passengers can also control specific LED lighting for various areas of the lounge, based off their preference. Remember that there are often long walking distances within airports and that this may cause you to require assistance. Pre-arranging any necessary assistance will ensure that it’s available and that no time is lost in waiting for it to be arranged once you arrive at the airport. Gatwick Airport provides assistance lanes for those who require additional help to get them to their flight on time. 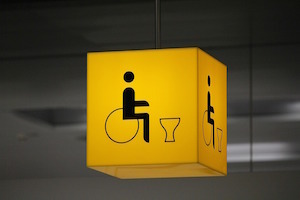 Airport Parking Shop have a whole collection of articles written for those with different disabilities, ranging from how to make your journey easier, to what UK Airports currently have in place to make the process less stressful. Pick a topic from the below list to read more.